What does that mean to me??? Being “well watered” makes me think of being full. Full to the brim. Full to the point where where my cup runneth over. He maketh me to lie down in green pastures; He leadeth me beside the still waters. He restoreth my soul; He leadeth me in the paths of righteousness for His name’s sake. Yea, though I walk through the valley of the shadow of death, I will fear no evil; for Thou art with me; Thy rod and Thy staff, they comfort me. Thou preparest a table before me in the presence of mine enemies; Thou anointest my head with oil; my cup runneth over. Surely goodness and mercy shall follow me all the days of my life; and I will dwell in the house of the Lord for ever. Oh, wouldn’t that be awesome? I long for that, after days of pouring out and pouring out and becoming dry and thirsty. Don’t you?? And I think this requires a mental change more than anything. Because pouring out, the pouring out that we women do is like a watering can. We pour into others’ lives over and over until there is nothing left. I think society, our culture, and heck, perhaps even the “church” tells us that’s what we are supposed to do. That’s what a “good little Christian woman” looks like. We are told that’s giving our all, and that’s the mark of a good Christian life. In reality that turns into us living in an environment of scarcity. We are so empty all the time and we frantically run around trying to fill ourselves up. With something. Anything. Because we believe our value comes from that act of pouring out. You see this in Christian circles – those are the women who are running themselves ragged trying to do and be. You see evidence of this in our society as well; why else would you constantly see articles about “me time” or how a 10 minute bubble bath will help you recharge after a long day?? I fall into this trap constantly, and I bet I’m not the only one. This frenetic race to rush, rush, rush. Put something, anything, back into that cup before someone wants me to pour in their lives again. It’s a vicious, vicious trap that ensnares us into thinking our value comes from only what we can give. But look at that idea of “a cup running over” again. It’s so full. So full that extra spills out. It can’t help but spill out onto the ground around it. The spilling out doesn’t take away from the fullness, it’s a byproduct. You can’t run over unless you are over-full. And what has the cup done? Absolutely nothing. Nothing but sit still and be open and willing to be filled. I at first wanted to call this a spirit of generosity (to play on the word scarcity), but I don’t think I really can. It’s really the spirit of being still before God and being open to being filled. That’s the real opposite of that scarcity world. It’s not our job, ladies, to go out and DO. We can do and do and do until our cup falls apart, but only Christ can spill that life-giving water into the right places. 0Only Christ can save. How much of our doing is our attempt to do enough to be worthy of our salvation? To make up for just being a cup and not the water itself? I really think that Christ WANTS to give us that life more abundant. He came for that, after all. Christ wants to lead us into fields where our most basic needs are met. He wants to restore our souls and He wants to lead us where he wants to be. Once we are there, He wants to protect us. He wants to guard us and comfort us. He wants to prepare us feasts in the midst of our battles. He wants our enemies to watch us dine on His richness while they waiting to attack. He wants to cover us in His blessings. He wants to fill us with his love and mercy and grace SO MUCH that that it just spills out and there is no way that anyone around us can help but be touched by His life giving water. He just wants us to live with him. He hasn’t asked us to do anything, but to be open. When we can let go of our need to be the one to do, and be willing to be open, Christ will rush in to fill us. When we can step back from our need to get the accolades from the work, Christ can use us to pour out, with no help from us at all, to the world around us. Being still is absolutely the hardest thing in our culture to do. That’s why it’s so powerful and revolutionary. What do you think? 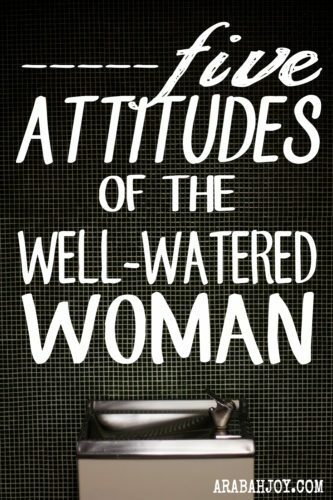 What does being a well watered woman mean to you?